Losing weight requires commitment – a long-term, often challenging and sometimes difficult commitment. But sometimes losing weight is the only choice. When a much-heralded, long-established automaker faced government mandates to improve fuel efficiency, it embarked on the challenge and determined that reducing the weight of its best selling vehicle was the top way to meet this mandate. Focusing on its most popular vehicle, the Ford F-150 truck and its related iterations, Ford Motor Co. committed to a nearly $1 billion weight-reduction effort. This led to a massive upgrade of its Dearborn, Mich., truck plant to convert it from steel to aluminum vehicle production. Through a multi-prong approach involving new materials and assembly techniques, the company reduced the weight of its iconic truck by more than 700 lbs. while keeping the rugged intangibles that make the F-150 the most popular truck on the market. Along the way, this belt-tightening campaign caused a tectonic shift in the supply chain, and it fostered massive research efforts in factories and facilities around the world. The Ford F-150 truck produced at the famous Ford Rouge factory is made mostly of aluminum alloys. In 2015, Ford rolled out the first of its aluminum-intense F-150 vehicles. The truck features an all-new, high-strength steel frame, and a high-strength, military-grade aluminum-alloy body and cargo box. It has aluminum doors, hoods, fenders, floors, side panels and more. The switch to aluminum required a massive plant retooling effort. Traditional spot welding equipment was replaced with state-of-the-art joining technology used to assemble the trucks with self-piercing rivets, structural adhesives and other joining methods and to do so at a rate of about one truck per minute. 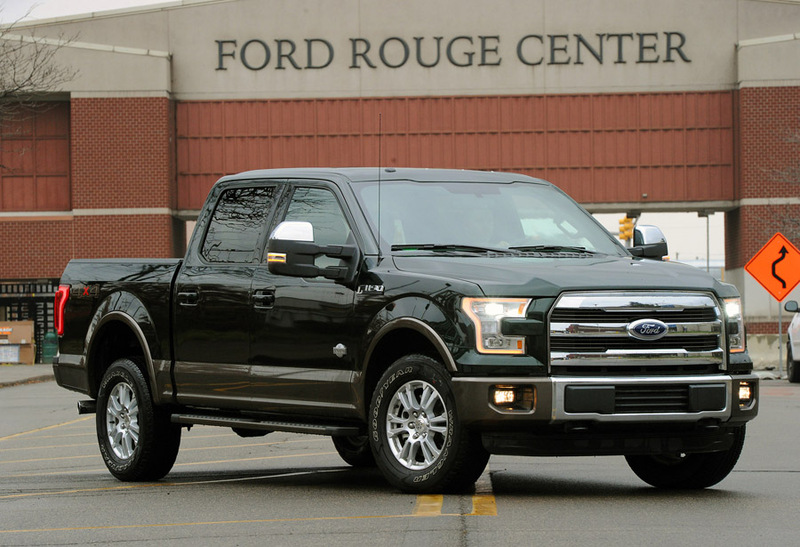 This change is seen in the numbers: in 2014, a typical F-150 truck underwent 5,000 spot welds. A year later, most of those spot welds were gone, replaced by 2,000 rivets. Matthew Zaluzec, senior researcher at Ford’s Research and Innovation Center in Dearborn, says the timing was right for overhauling production. The Ford F-150 truck produced at Ford’s Kentucky truck plant is made mostly of aluminum alloys. The innovation center is staffed by researchers who bring diverse and specialized skills to the product development community. These include enterprising men and women with knowledge of the body structure, powertrain and chassis; experts in sheet metal and casting, extrusion and hydroforming; and researchers exploring new alloys and metal pretreatment, riveting, adhesives and resistance spot welding. 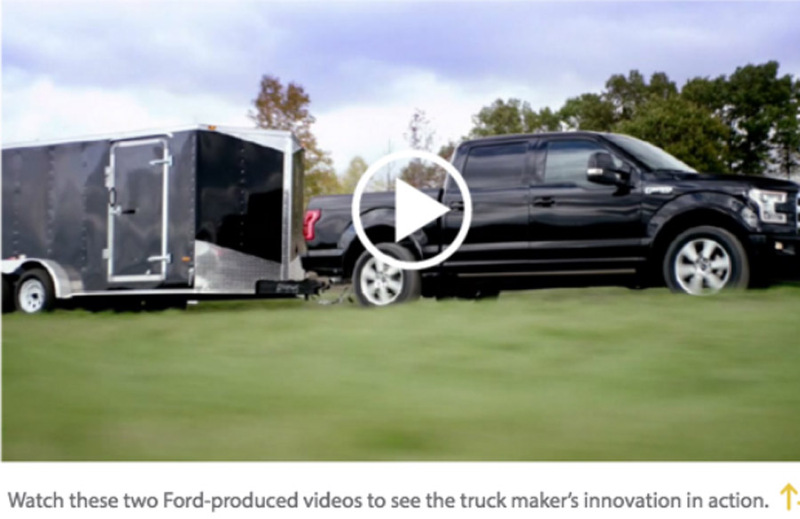 Over the course of five years, their efforts led to some of Ford’s newest innovations. In essence, whatever works best for the job. When the researchers began to consider how best to lightweight the F-150, they didn’t come out and say, “we’re going to make it out of aluminum.” First, they developed performance targets – developing performance parameters for towing, hauling, fuel economy and more – and then ferreted out the best solution. The researchers chose 5000-series and 6000-series aluminum. The magnesium-alloy 5000 series is easily stamped, making it ideal for complex body panels. The 6000 series, alloyed with magnesium and silicon, was selected for outer body panels and cargo bed areas because it offers higher tensile and yield strengths that can hold up to the daily rigors of its users andMother Nature. The company had some in-house knowledge from which to draw. Ford had produced aluminum vehicles before. Economy of scale is perhaps an understatement as the F-Series is the leader in truck sales, having sold more than 40 million trucks since it first appeared circa 1948. 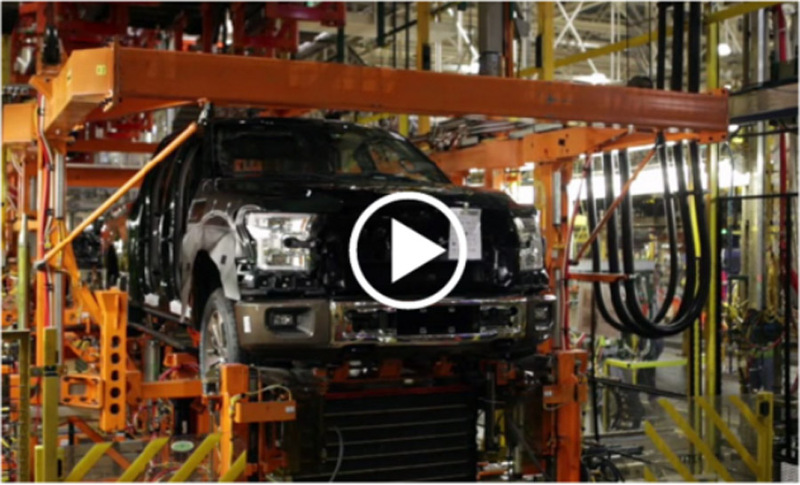 An operator helps build a Ford F-150 at Ford’s Rouge factory. Challenges ran from supply to assembly. On the supply side, how do you obtain enough aluminum with which to build one of the world’s best selling vehicles? On the assembly side, how do you join aluminum-based parts when your current assembly technology – spot welding – is not suited for the new material? The F-150 ramp-up was felt all along the supply chain. To put it in to perspective, a product that sold more than 800,000 vehicles last year was converted from mostly steel to mostly aluminum construction. How does a company obtain enough aluminum sheet to make all of those trucks? “We’re not talking about a few hundred thousand pounds, we’re talking about billions of pounds of aluminum to support our product development,” Zaluzec says. Ford’s primary source of aluminum comes from Alcoa’s facility in Davenport, Iowa. A smaller company, Novelis, also supplies Ford from its facility in Oswego, N.Y.
A key aspect of the supply agreement is a closed-loop recycling program developed jointly by Ford, Alcoa and Novelis. Novelis relies on scrap material for producing 50 percent of the automotive aluminum sheet that it sells. The company invested $48 million in a new recycling plant in Oswego that includes an 81,000-sq.-ft. facility for processing, sorting and storing automotive scrap aluminum. Much of this scrap comes from the Dearborn Truck Plant, which generates thousands of pounds every day. 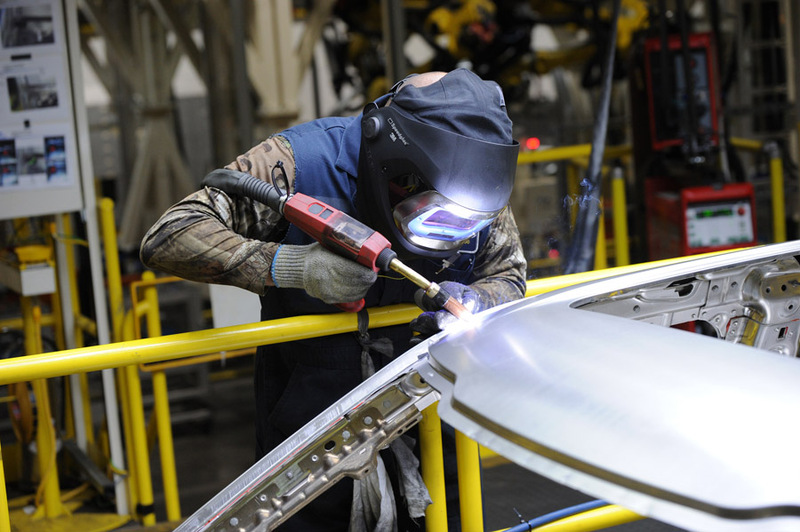 Only 60 percent of the 6-ft.-wide rolls of aluminum supplied to Ford is actually used to make body parts for the F-150. To aid in the recycling effort, Ford invested $60 million in equipment to separate and shred the scrap before shipping it back to its suppliers. Ford recycles as much as 20 million lbs. 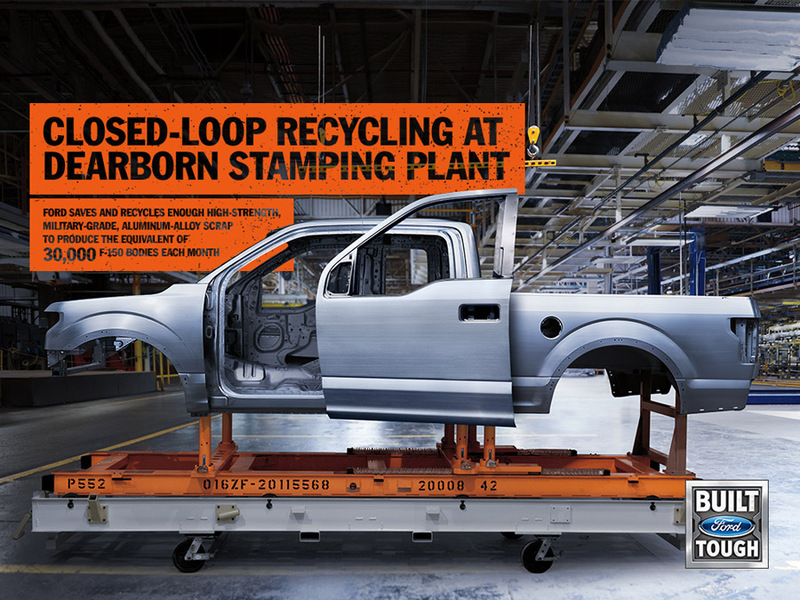 of aluminum stamping scrap per month using the closed-loop system at the Dearborn Truck Plant, which builds the F-150. Other suppliers, such as rivet manufacturers, also soon felt the avalanche of F-150 demand. Rivets are the primary source of joining components. Ford uses self-piercing rivets that don’t require a predrilled or punched hole, unlike conventional riveting. The rivet makes its own hole as it is inserted. The fastener pierces and fastens in one operation, simplifying assembly and reducing costs while providing a strong, reliable joint. Self-piercing rivets achieve the results and quality of spot welding without many of the risks, such as toxic fumes, sparks and noise. And, the hardware boasts the same tensile and peel strength as spot welds, but with twice the fatigue life. Unlike spot welding, rivets do not generate heat, which eliminates problems associated with spot welding of pure aluminum and aluminum alloys that melt below 600 degrees C. Although rivet assembly is slower than using an automated spot welding system, Zaluzec says the difference is negligible. The F-150 uses a combination of self-piercing rivets and structural adhesives in a significant percentage of the cab. Applying the adhesive along a flange’s larger surface area provides for additional stiffness, which is good for the body structure and reduces NVH (noise, vibration and harshness) that improves the passenger’s riding experience. Structural adhesives are often used in architectural applications, but in those uses, the structure rarely travels down a highway at 65 mph. Ford’s F-150 truck is aluminum intensive, as this animation depicts. While the revamping of the F-150 appears to be a success – the truck continues to win national awards and outsell its competitors – the Research and Innovation Center continues to focus on future endeavors, as does its various supply chain partners. Unsurprisingly, Ford’s future lightweighting efforts will focus on more areas than body structure. One such effort is to look beyond the 5000- to 6000-series aluminum alloys to stronger yet lighter variants. For example, Alcoa developed a milling process called Micromill that changes the metal’s micro-structure to create an aluminum alloy with 40 percent greater formability and 30 percent greater strength than traditional aluminum. The easier-to-shape material could be used for the inside panels of doors and external fenders. The downside? Alcoa is currently only able to make this material in small volumes. Similarly, carbon fiber materials show great promise and might indeed be the next big material in automotive. But for now the strand-like material, woven and combined with other materials to turn it into a composite, is not ready for the high-volume world of the F-150 and its ilk. Ford is working with Dow Chemical and DowAksa to develop carbon fiber. The two companies signed a development agreement to research high-volume manufacturing of automotive-grade carbon fiber that can be applied to random fiber formats while maintaining compatibility with thermoset and thermoplastic matrices. In a production environment, carbon fiber can be a challenge because of its multiple fiber strands, their orientations and the complex matrix combined with epoxy or resins to keep it all together. One of the ways Ford is working to overcome this challenge is through computer-aided analysis, often called computational material engineering. To get these lightweight materials into production, a number of assembly scenarios are considered. Where will the component be used and to what environmental conditions will it be exposed? What variations in external and internal temperatures will it face and what kind of exposure will it undergo? Will these different metals require different coatings and pretreatment processes and can they be used in tandem for corrosion control and other issues? 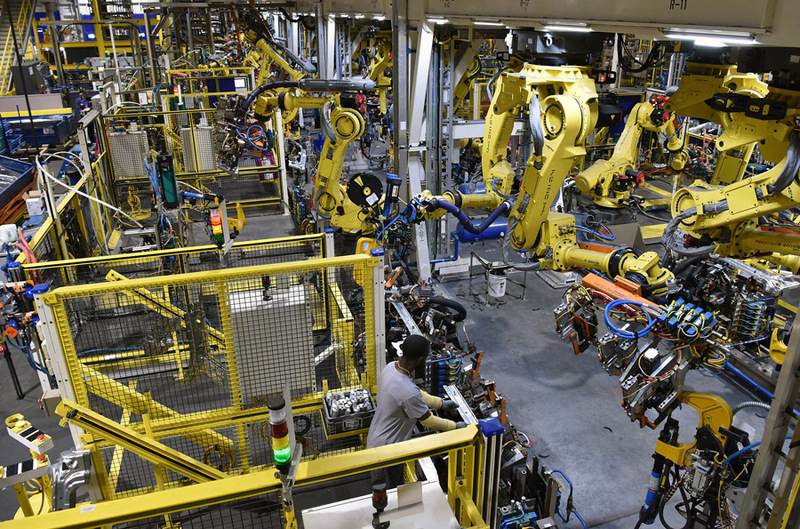 An assembly line at Ford’s Kentucky truck plant featuring self-piercing riveting and adhesive application robotic equipment. The same issues apply, he says, when introducing a structural composite reinforcement. In that case, a mechanical joint is most likely required, but using a rivet to join a metal to a composite will give a weak joint, and production might have to predrill a hole and use a mechanical fastener with an adhesive. 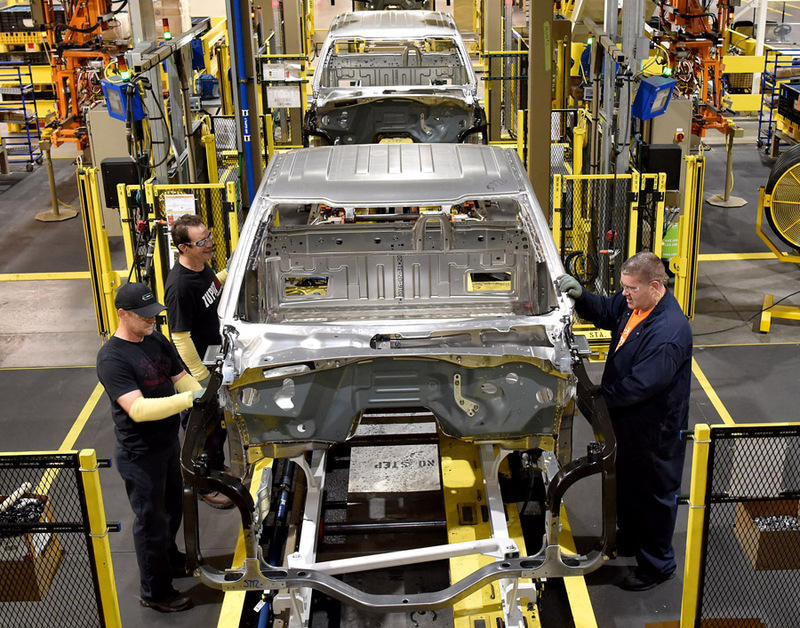 No matter the challenge, if it is the best solution, chances are, eventually, that a manufacturing or assembly concept will find its way to a Ford production operation.